马冬梅, 黄樟翰, 朱华平, 谢骏. 广东粤北地区禾花鱼的形态特征及遗传学分析[J]. 渔业科学进展, 2019, 40(2): 33-42. DOI: 10.19663/j.issn2095-9869.20180126002. MA Dongmei, HUANG Zhanghan, ZHU Huaping, XIE Jun. Morphological Characteristics and Genetic Analysis of the Rice Flower Carp in the Northern Region of Guangdong Province[J]. Progress in Fishery Sciences, 2019, 40(2): 33-42. DOI: 10.19663/j.issn2095-9869.20180126002. Corresponding author: ZHU Huaping, E-mail: zhhping2000@163.com. Abstract: In order to investigate the germplasm of rice flower carp cultured in the paddy fields of the northern region of Guangdong Province, 67 rice flower carp individuals were chosen at random. After measuring their morphological traits and calculating their morphological ratios, the rice flower carp were divided into two clusters according to shape. One cluster tended to have an elongated shape, and the other had a rounded shape. There were highly significant differences in the ratios DCP/LCP (depth of caudal peduncle to length of caudal peduncle), LC/LCP (length of Caudal fin to length of caudal peduncle), and DB/LS (body depth to soma length) between the long-shaped and round-shaped fish groups. The results suggested that the differences between the two groups were dependent on these three parameter values. Principal component analysis of the morphological characteristics of these rice flower carp and of six common populations reported previously was carried out. The results showed that in the PC1, which characterized the shape of the whole body, the long-shaped flower carp was similar to Cyprinus carpio var. xingguonensis, C. carpio var. specularis, and C. carpio var. Jian, and distinguished from the round-shaped rice flower carp, which clustered with C. carpio var. color and C. carpio var. wuyuannensis. In the PC2, which characterized the shape of the head, the rice flower carp of both shapes clustered together and were distinguished from C. carpio var. specularis and C. carpio var. color. The cluster analysis suggested that the long-shaped rice flower carp was similar to C. carpio var. xingguonensis, C. carpio var. specularis, and C. carpio var. Jian within one cluster, and C. carpio var. wuyuannensis and C. carpio var. color in another cluster. The round-shaped rice flower carp was positioned between the two clusters. These results indicate that rice flower carp are mixed strains. It is necessary to carry out family-wise selection on the basis of morphology. Furthermore, polymorphism analysis of a partial sequence (606 bp) of the COⅡ gene from rice flower carp showed that there were two polymorphic sites that formed four genotypes, where the proportion of polymorphic sites was only 0.33%. 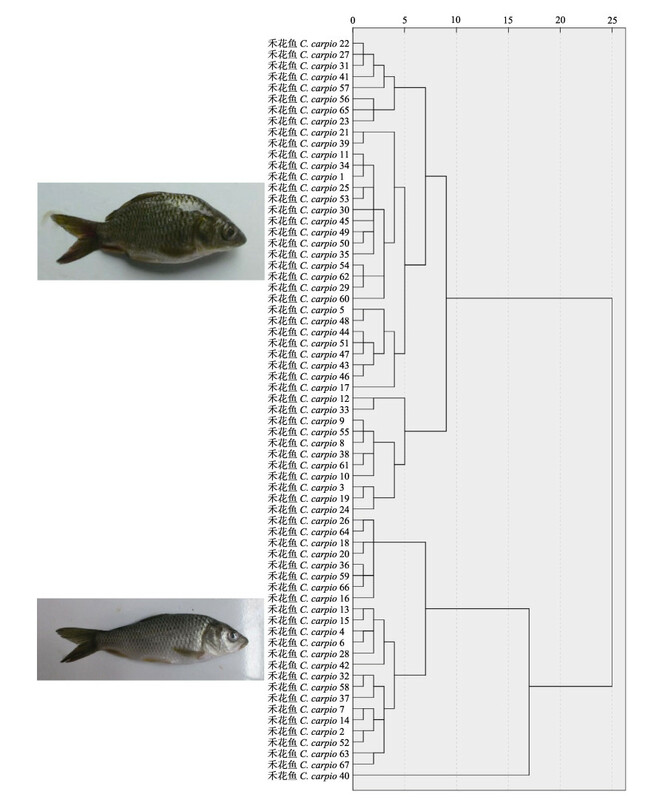 Compared with the seven species from Cyprinus, the phylogenetic tree based on the COⅡ gene sequences indicated that rice flower carp is one population of C. carpio. These results of the polymorphic investigation and genetic analysis in the present study lay the foundation for further breeding research on rice flower fish.